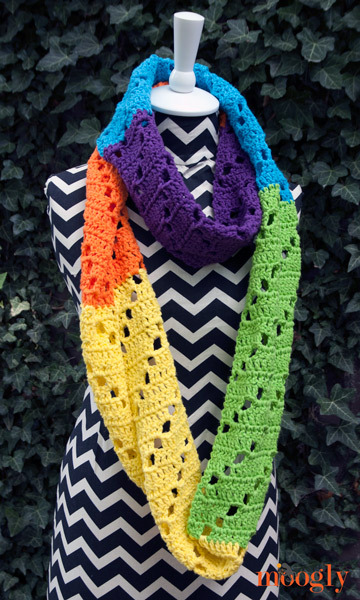 The Neon Dreams Infinity Scarf is indeed the stuff dreams are made of. 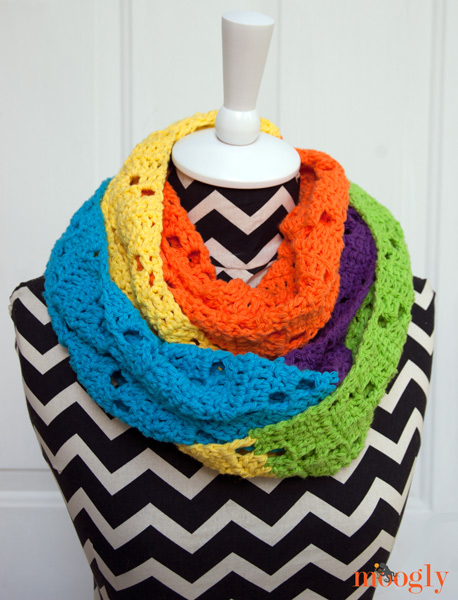 Dreams of bright, bold hues, ultra modern color blocking, super chunky scarves and cowls, and infinite possibilities! 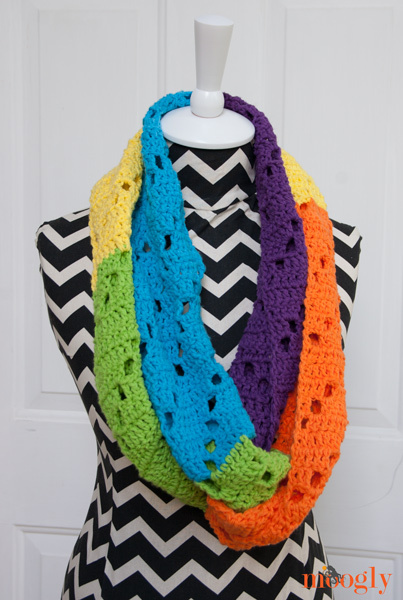 Once the crochet pattern idea for the Neon Dreams Infinity Scarf came to me, it demanded to be made. I started it late one night, and had it finished by the middle of the next – a neon fever! And it packs a COLOR PUNCH! It’s long enough to wear a variety of ways, but anyway you wear it, it’s sure to get you noticed! I’ve written the pattern in standard format, starting each row with a ch 3, which counts as the first st of the row. However, I recommend using the Chainless Starting Dc instead for an even better result! After Row 1, dc into the ch sp when appropriate, rather than the ch itself. Every row will have 28 sts, including the chain sts. If you use a st marker to mark the side of every Row 19 repeat, it will make counting rows to stay on pattern easier. Row 2: Ch 3, dc in the next 6 sts. [Ch 2, skip 2 sts, dc in the next 7 sts] twice. Ch 2, skip 2 sts, dc in the last st. Turn. Row 3: Ch 3, dc in the next 7 sts. [Ch 2, skip 2 sts, dc in the next 7 sts] twice. Ch , skip 1 st, dc in the last st. Turn. Row 4: Ch 3, dc in the next st. [Ch 2, skip 2 sts, dc in the next 7 sts] twice. Ch 2, skip 2 sts, dc in the last 6 sts. Turn. Row 5: Ch 3, dc in the next 3 sts. [Ch 2, skip 2 sts, dc in the next 7 sts] twice. Ch 2, skip 2 sts, dc in the last 4 sts. Turn. Row 6: Ch 3, dc in the next 5 sts. [Ch 2, skip 2 sts, dc in the next 7 sts] twice. Ch 2, skip 2 sts, dc in the last 2 sts. Turn. Row 7: Ch 4, skip the next st, dc in the next 7 sts. [Ch 2, skip 2 sts, dc in the next 7 sts] twice. Dc in the last st. Turn. Row 8: Ch 5, skip the next 2 sts, dc in the next 7 sts. [Ch 2, skip 2 sts, dc in the next 7 sts] twice. Turn. Row 9: Ch 3, dc in the next 4 sts. [Ch 2, skip 2 sts, dc in the next 7 sts] twice. Ch 2, skip 2 sts, dc in the last 3 sts. Turn. Row 18: Ch 3, dc in the next 2 sts. [Ch 2, skip 2 sts, dc in the next 7 sts] twice. Ch 2, skip 2 sts, dc in the last 5 sts. Turn. Row 20 – 28: Repeat Rows 2 – 10. Break yarn and finish off. Row 29 – 55: With Color B, sl st (or use Standing Dc) to join to last st of Row 28. Repeat Rows 11 – 19, then repeat Rows 2 – 19. Break yarn and finish off. Rows 56 – 82: With Color C, sl st to join to last st of Row 55. Repeat Rows 2 – 19, then repeat Rows 2 – 10. Break yarn and finish off. Rows 83 – 109: With Color D, sl st to join to last st of Row 82. Repeat Rows 11 – 19, then repeat Rows 2 – 19. Break yarn and finish off. Rows 110 – 136: With Color E, sl st to join to last st of Row 109. Repeat Rows 2 – 19, then repeat Rows 2 – 10. Break yarn leaving an 18″ tail for sewing. Using the tail, whip st Row 1 and Row 136 evenly together to form infinity scarf (or leave unsewn for long standard scarf). Weave in all ends. Now it’s time to play! Wear it long and loose, wrap it around and around, tie it in a knot, pull it over the shoulders as a wrap – the Neon Dreams Infinity Scarf is ready for whatever you dream up! It’s fun in neon brights, but would be lovely in autumn colors, cool blues, jewel tones – whatever palette pushes your On button. I can’t wait to see what you all do with it! For Rows 110 – 136, shouldn’t we join Color E instead of Color C again? Whoops! Thank you – I’ll fix it now! This is awesome! I can’t wait to make one! 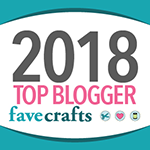 You’ve been featured on my blog this week! 😀 Thanks so much Kristin! Love this pattern! ty so much! 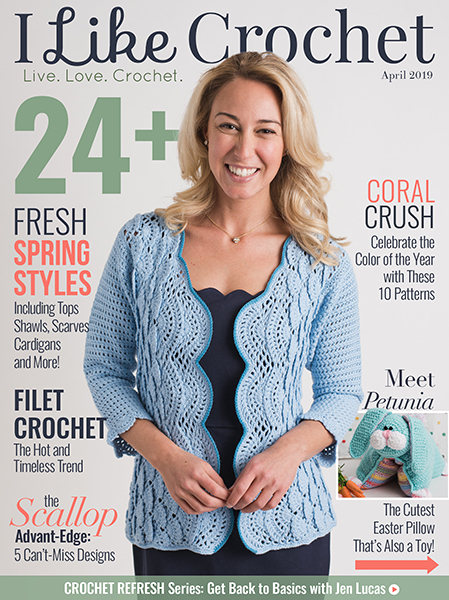 I love all your crochet patterns that you have done but my favorite one is your Scoody. I have made at least 10 of them so far. And they are all different as well. Thanks so much for that pattern. Another MUST make! And perfect timing as I just finished a project a couple days ago and needed something new to start tomorrow. beautiful! It would be perfect for the chilly evenings we are having here at the moment! I love all of your patterns. 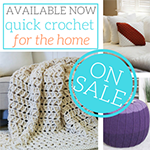 I love crocheting gifts for my friends and I use many of your designs. What I love is that you show so many ways of how the scarves can be worn. LOVE the Blackberry Salad stripes, blanket and bonnet. Made the bonnet in red, white, and blue and it is adorable! 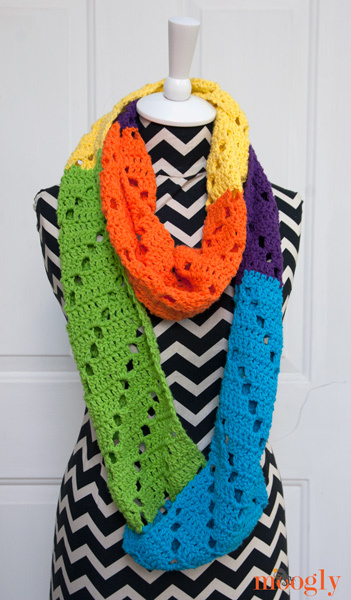 I would really like to make something like this in Christmas colors, but the total would only be four stripes ( red, white, green, white) or eight (red, white, green, white, red, white, green, white). Any suggestions? 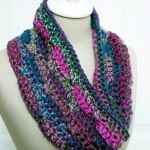 I love the scarf pattern and the beautiful colors. I REALLY want to win the book!!! I love the scarf and the beautiful colors! I REALLY want to win the book! I tried this pattern and my scarf was not coming out correct. Do the skip two and chain two line up? Mine were not and I didn’t always have 28 stitches sometimes I had less. I tried this several different times and could not get it. What was I doing wrong? 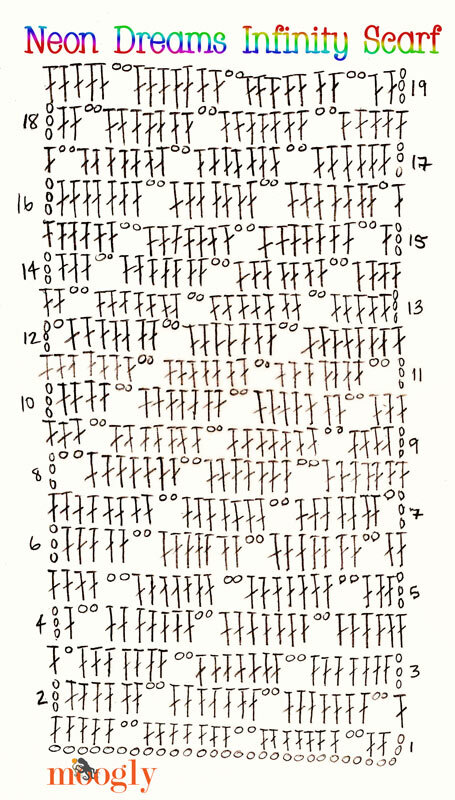 The 28 includes the chains, and the ch 3 at the beginning of each row counts as a stitch as well. Whenever you skip two, you also chain two. 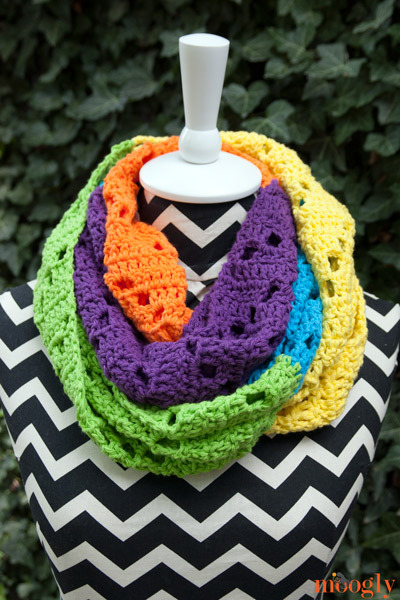 The “holes” created by the skip 2/ch 2 should form a repeating diagonal pattern across the width of the scarf. I’ll try to add a chart! Do you have any suggestions on making this a two-color scarf? I would love to do this in school colors. This would be so awesome to send to my college kids…or make one to wear to my hometown football games. Cay, since it’s 136 rows, you could do the first 68 in one color and the last 68 in the second, or change colors every 34 rows for 4 blocks of color! Thank you for sharing this great pattern. I know some teens who will be getting this for Christmas! 😀 Thank you Sue! 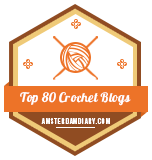 I’m glad the chart works – I tried using photoshop for a few, but you’re right, it took ages! I’d like to think I’m getting better at the handmade ones as I go. are you planning to make a video. I would love it. Thanks so much. I just love the Pattern and it looks quite easy. 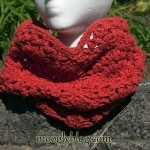 Do you think it would look OK if I used my leftover yarns? I have a lot of partial skeins and I would like to use them up instead of buying more yarn. It would have a stripped effect than blocks.What do you think? I’m working on this scarf right now, its coming out so nice. Thank you for creating this pattern, I love it. 😀 I’m so glad you like it! I wore mine this morning! I’ve made up a scarf and am ready to stitch the ends together, do you twist one side to form a moebus ring or join straight? If I join straight it seems like I should frog row 136 to match the diagonal squares pattern. If I twist they do line up but then the pattern reverses. Thanks! This is beautiful! I *LOVE* the colors. Thank you so much for sharing with us. 😀 Thank you so much Toqua! 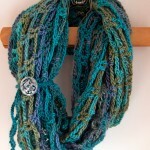 just saw this one hour ago and within half hour hubby went out shopping for yarn for me for two of them! My daughter-in-law and my granddaughter each are going to love having this!!!! Thank you so much!! This is amazing! I’m definitely going to make one. Thanks for sharing the pattern with us! Wondered if tis could be converted to knitting? I’ve just started the scarf but since I’m vertically challenged :-). I’m concerned this scarf might be too long. Love this pattern. Am finishing up the first one in an earth tone print yarn and then going on to the brights like you have done! This has become my go to site for fast easy to understand directions. Love the chart. Saved it as a pic on my tablet and makes creating much easier. 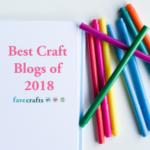 I was never a fan of chats, but you have made this easy to follow and a joy to create. I always look forward to what you make next. ♥ Oh wow, thank you so much Sandy! That makes my day! i tried this pattern and it came out great! Each color I did 24 rows. It came out beautifully. 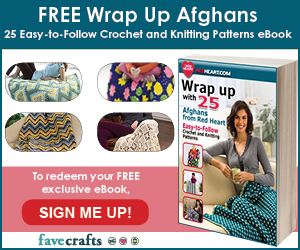 Thanks so much for sharing this pattern.? THANK YOU Iwasjust trying to decide on some CHRISTMAS colours for a scarf, this is perfect. 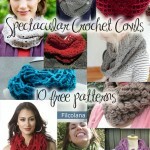 I will use solids and variegated.